Melasma, also known as ‘chloasma,’ is a common skin condition in adults characterized by light to dark brown or greyish discoloration, also called hyperpigmentation, found primarily on the face. This hyperpigmentation occurs when the melanin, the pigment that gives our skin its color, is overproduced in the skin. The exact cause of melasma is not known, but experts believe that it could be triggered by several factors, including pregnancy, birth control pills, hormone replacement therapy (HRT and progesterone) and sun exposure. There is even new evidence that suggests that melasma has vascular characteristics. When melasma occurs during pregnancy, it is referred to as pregnancy mask. Pregnancy mask generally appears in a symmetrical pattern on the upper cheeks, forehead, upper lip, nose and chin. Pregnant women experience increased estrogen, progesterone, and melanocyte-stimulating hormone (MSH) levels during the second and third trimesters of pregnancy. Pregnancy-related melasma is believed to be caused by increased hormones levels stimulating melanocytes, the cells in the skin that produce pigmentation, to produce more melanin when the skin is exposed to the sun. Women with a light brown skin type who are living in regions with intense sun exposure are particularly susceptible to developing this condition. Some women find that their pregnancy-mask disappears within a few months after delivery. For other women, however, the symptoms persist. Although melasma is not painful, dangerous or contagious, it can be embarrassing and have a significant impact on a woman’s self-confidence and emotional well-being, potentially affecting her quality of life. While there are no cures for melasma, there are several prevention and treatment options that may improve the appearance of the pregnancy mask. Important prevention methods include sun avoidance and daily application of a broad-spectrum SPF to avoid stimulating pigment production. There are also a variety of treatments to correct melasma. Epidermal hyperpigmentation, which affects the top layer of the skin, responds well to products. A skin care regimen that includes tretinoin and 4% hydroquinone, such as the Obagi Nu-Derm System, are the most effective at addressing this type of hyperpigmentation. Complimenting that skin care regimen with a professional in-office light peel treatment, such as the Perfect Peel, will enhance and expedite results. Dermal hyperpigmentation, which affects the deeper dermal layer of the skin, will not respond to products alone. Chemical peels that penetrate to the dermal layer, such as the standard Obagi Blue Peel, are needed to correct this type of hyperpigmentation. An added benefit to using chemical peel treatments is that in addition to treating hyperpigmentation, they simultaneously address other skin concerns such as fine lines, wrinkles, and acne scarring. 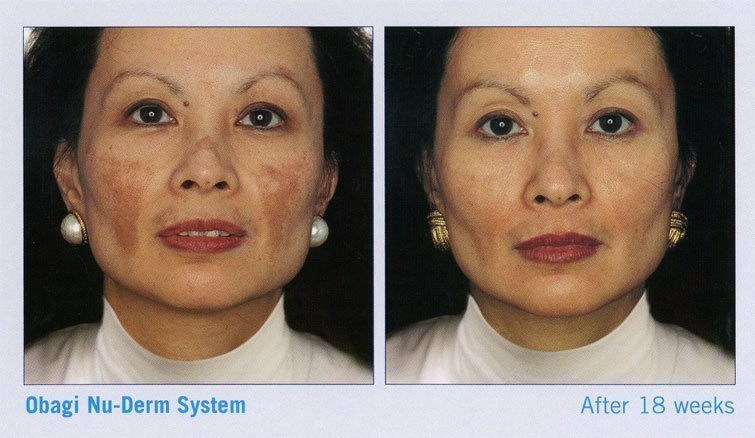 To address the vascular characteristics of melasma, IPL/Photofacial treatments can be used. There are a wide variety of treatment options available, so it is important to have a skincare professional assess your skin and determine which type of treatment best matches your lifestyle and the results you are trying to achieve. Call the Skin Klinic at (480) 451-1700 to speak with one of our skin experts and find out how we can help you take off the “mask” and show off your skin!